Last summer one of my best friends retired from the US Navy after a long and distinguished career. His retirement ceremony was held near Norfolk, Virginia, a place I used to live years ago. To say Norfolk is a Navy town is like saying there’s a little bit of ocean near San Diego. When I lived in Virginia Beach I wasn’t in to photography, I played music back then, but I was in to history. As a result, I regretted those years without a camera, chalk that up to “what were you thinking?” Two things I knew about the Hampton Roads area and my trip was that there would be many sights to see and that I’d be meeting up with numerous friends living there. I also knew I’d be up late and waking early to shoot the places I wanted. There was so much to see that I couldn’t possibly squeeze everything in to just a few days. Online research was necessary to find what I wanted to see, prioritize them, and have back-up plans for each day and site. In the Norfolk are there were a number of things that could prevent me from getting to where I wanted to shoot; the Hampton Roads Bridge Tunnel and closures, traffic, meeting up with friends, weather, and the possibility of sights actually being closed were all things to consider. One place in Virginia Beach that seemed an interesting place to shoot was the Ferry Plantation House, a former slave plantation, where this photo on the right, called Stops, was taken. Given the many places I wanted to shoot, only one would happen rain or shine and I’d need to allot an entire day, Colonial Williamsburg. One of the really cool things about Colonial Williamsburg is that if you just want to shoot outside, it’s totally FREE! That’s right, FREE as in you pay nada, zero zero point zero zero! That was exactly what I wanted because I had no intention of shooting indoors with so many cool buildings, streets, and residents walking about in period clothing. If it rained, I’d get wet and that was just fine because anybody who knows me will tell you that I love shooting in just about any weather, except sunny. 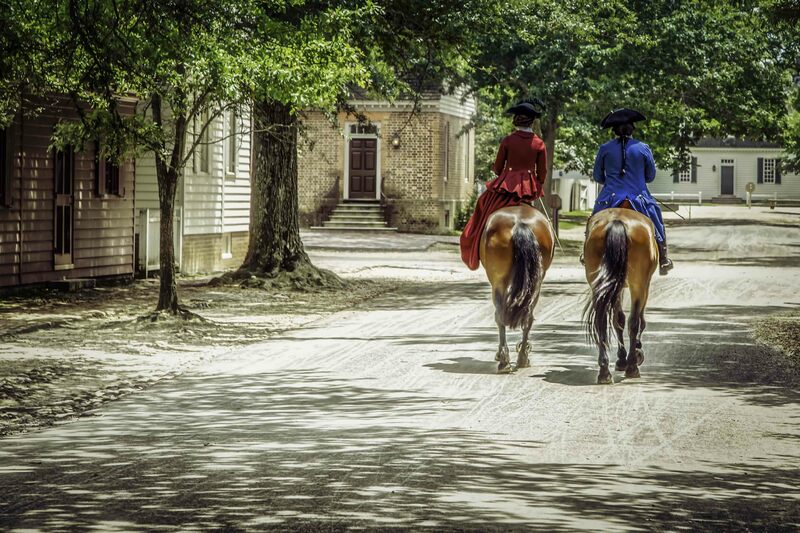 The photo at the top of this blog, Riders, was taken in Colonial Williamsburg and is not an uncommon scene if you visit. To the left is Spokes, a revolutionary war era canon sitting behind the Colonial Williamsburg Courthouse. Williamsburg is littered with colonial items that make for interesting photographs. The best thing about shooting outdoors is that you won’t be trying to shoot around tourists. Had I paid to go inside the historic building, I would have been filing through buildings on one of the many tours hoping to get decent pics with indoor lighting. I could go back to Williamsburg and spend another day shooting completely different subjects. Yes, it’s that cool. There were another three locations that I wanted to shoot and they were all close to each other; Historic Jamestowne, Jamestown Settlement, and the Yorktown Battlefield where the British surrendered to George Washington ending the American Revolution. One thing to consider about a Jamestown visit is that there is a considerable difference between Historic Jamestowne and Jamestown Settlement. If you want to visit the true Jamestowne site, the historic location of the British colony and where archeologists are actively digging to this day, this is Historic Jamestowne. This is where the history actually happened and an incredible place. However, the other location, Jamestown Settlement, is a living museum nearby that is a reconstruction of the historic colony; these are completely different. The good news is that they are only about ten minutes apart and you’ll pass by Jamestown Settlement on the way to Historic Jamestowne. The photo above at right, Firemaker, portrays a Native American woman tending to a fire and was taken at Jamestown Settlement. The anchor and bow of the USS Wisconsin (BB-64) in Norfolk, Virginia. The USS Wisconsin (BB-64) as seen through the window of a parking garage in Norfolk, Virginia. The USS Wisconsin (BB-64), a World War Two era battleship is the centerpiece of Norfolk’s maritime science center called the Nauticus. It sits in the heart of the city and makes for great photos, especially if you climb the stairs fo the parking garage across the street! Here I was able to capture three completely different images from the same location. The photos on the left (Anchor Up) and the in the middle (Norfolk) were taken from the exact same location but with different lenses. The photo on the right (Dirty Glass) was taken walking up to the roof of the garage. The nice thing about the Norfolk area is that there is so much to see that I actually found thing to shoot on the way to thing I PLANNED to shoot! One of those times is in the photo at right, Country Road, taken one afternoon while driving to one of my destinations when shooting rural areas was part of my back-up plan if I got caught north of the Hampton Roads Bridge Tunnel during a closure. Guess what? The tunnel closed because of an accident and I had a plan! Virginia has some of the most beautiful countrysides if you get off the trail a little bit. Sometime in the future I’d like to just drive Virginia’s countryside searching out places like this, no agenda, just drive and see what’s out there. In the end, the weather held out and everything went mostly as planned, even enacting my back-up plan proved great for photos! On the left below is the Royal Palace at Williamsburg which seems like it could be straight out of England and on the right is the Cape Henry lighthouse (1792) located in Virginia Beach. Returning to Norfolk with my family is now a priority, not just for visiting friends but getting our girls out and to have some fun seeing incredible American History. If you like history, you need to check out the Hampton Roads area, there is so much to see! I’m thankful that my parents had me traveling when I was a kid and it stuck, hopefully the same will happen with my kids and they’ll appreciate the history of our country! The Governor’s Palace and Gardens at Williamsburg, Virginia. The Cape Henry Lighthouse in Virginia Beach, Virginia built in 1792. Next Post: #15 of 26 photos featured at Gurushots.com!